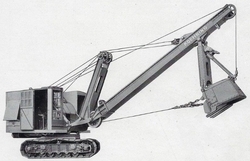 A unique compilation of manufacturer-produced films from the HCEA Archives, featuring: Koehring excavators from the 1920s and models 205, 251, 303 and 702 through the 1950s; early Austin-Western hydraulic cranes; Byers Traveler self-propelled and 61 crawler machines; Bucyrus-Erie 10-B, 15-B, 22-B and 38-B crawler machines and 1150-B walking dragline; and late 1950s-early 1960s Hopto hydraulic excavators. Also includes a clip of “Cranes in New York City” showing models built by Manitowoc, P&H, Lorain, Bay City, Marion and American. Includes both black and white and color footage, all silent except the Austin-Western segment. 1.5 hrs playing time, $25.00.